I love the lateral raise because it is such a rewarding exercise to carry out when you have undergone a recent body transformation. 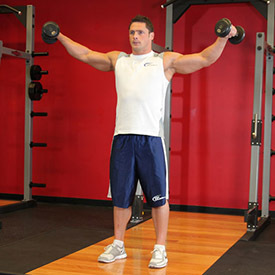 During the movement you get the benefit of seeing the definition in shoulders, chest and waist. 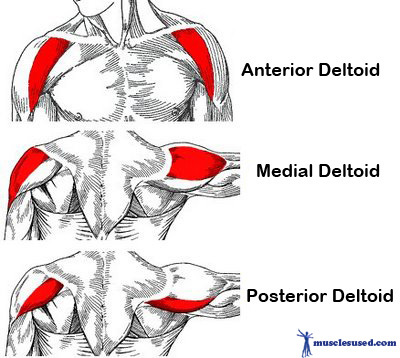 Ego reasons aside it is good to build those deltoids and make some nice strong shoulders. In some ways I feel that the lat raise is a great move for beginner – it’s not too complex to mess up. Don’t go too high and resist the temptation to go for heavy weight too quickly. A sign that it is too heavy is by doing a ‘push off’ to help assist the momentum of the move or bringing the weights down to the side in a resting position before the set has been finished. There are some variations to this (see this link at T-Nation), but with this one I have always stuck to the basics and recommend to others not to over complicate this one. There is also the Front Raise which is good for Shoulders, but doesn’t make my top ten. Livestrong – What Muscle do dumbbell lateral raises work? Cool and detailed as always James. Have you ever considered doing videos?